Merrie Monarch time is upon us and that means some of the best hula dancers in the world are gathering in Hilo to perform in the annual Merrie Monarch hula competition. There is a saying about hula: “I le‘a ka hula i ka ho‘opa‘a” – the hula is pleasing because of the drummer. It’s a well-known quote from Mary Pukui’s seminal book ‘Olelo No‘eau, and means that although the attention is given to the dancer, the drummer and chanter play an important role in the dance. Here’s a look at some of the instruments used in hula that you might see used during the Merrie Monarch hula performances. 1. The pahu, or hula drum, is the primary instrument of the kumu hula (hula teacher) and is considered sacred. The beat of the pahu guides the dancers, dictating the pace of the dance with the rhythm of the drum. 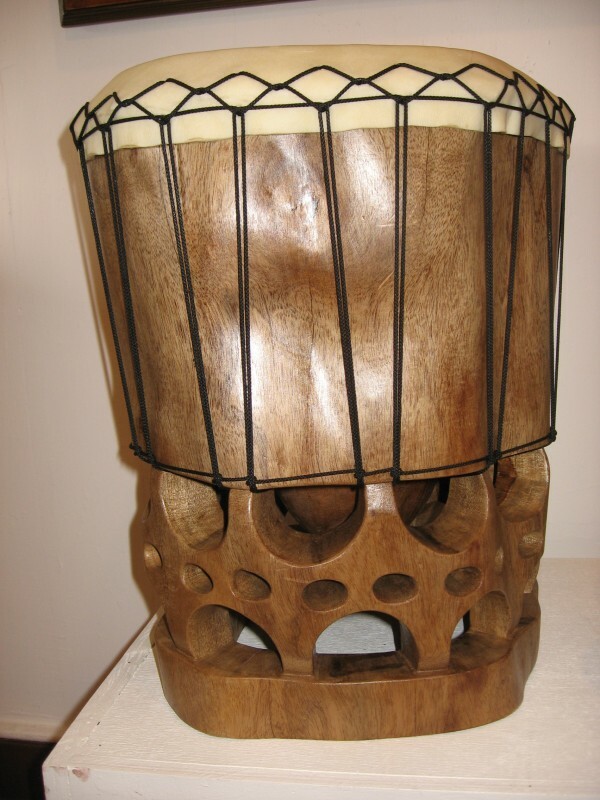 In the past, pahu drums were made of breadfruit trees, although these days coconut wood is more commonly used. The drums range from one to four feet in height. In pre-contact Hawaii the covering of the pahu drum was made with shark skin, but these days people use cow hide. The hula dancers, like the kumu hula, typically make all their own instruments. In fact, as part of their training to become a kumu hula, a teacher must make their own pahu drum. 2. Another drum used in hula is the small, light-weight kilu, also known as a puniu, which is made out of a half coconut and covered with animal skin — usually that of a fish. The drum usually accompanies the pahu. Dancers may place the drum on the ground or strap it to their thigh and play it during the hula. 3. 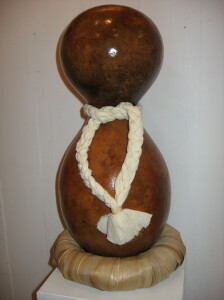 One of the most commonly seen instruments at hula performances is the ipu, or gourd. Kumu hula often use ipus, usually an ipu heke (double gourd), as a percussion instrument to create rhythm and sound for the chant and dancers. 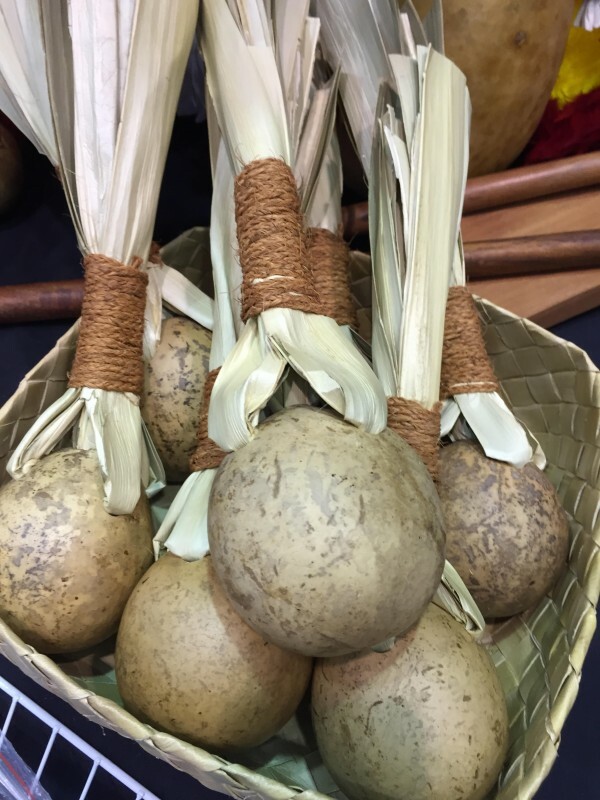 Ipu heke are made by taking two gourds of different sizes, cutting them off at the necks and joining them, so that the smaller gourd is on top. A hole is cut in the top gourd to allow the sound to escape. Ipu heke ‘ole, a single gourd cut off at the neck, is sometimes used by hula dancers during a dance. Because invasive insects are making it more difficult to grow gourds in Hawaii, it’s not unusual for halau to order gourds grown in California and the southwest. 4. Other instruments used in hula include the ‘uli ‘uli, or rattle. Made from gourds, the rattles contain small dark round seeds, usually ali’ipoe or canna seeds. ‘Uli ‘uli usually have a woven handle and feature feathers at the top. 5. 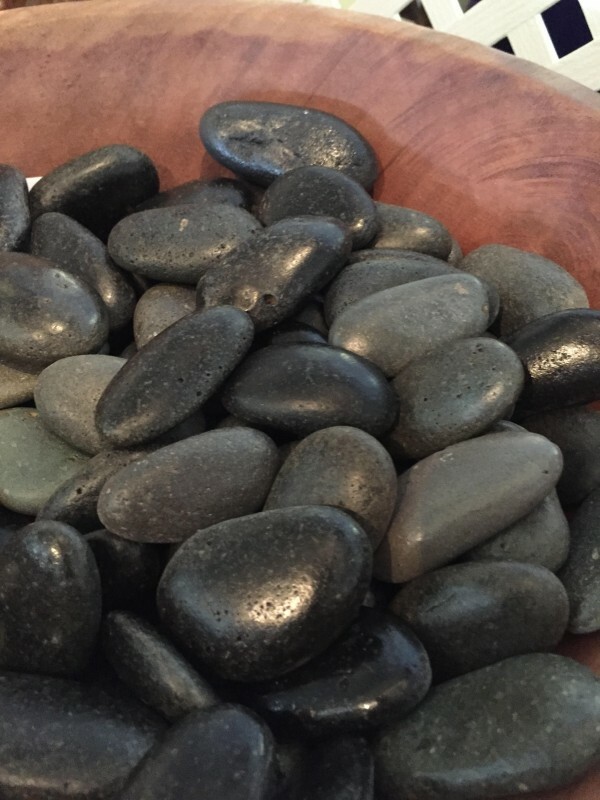 Not to be confused with the ‘uli ‘uli are ‘ili ‘ili, stones used by dancers in a staccato rhythm during a dance. Depending on the hula performed, a dancer will hold the water-worn lava stones in each hand, striking them together like castanets. 6. 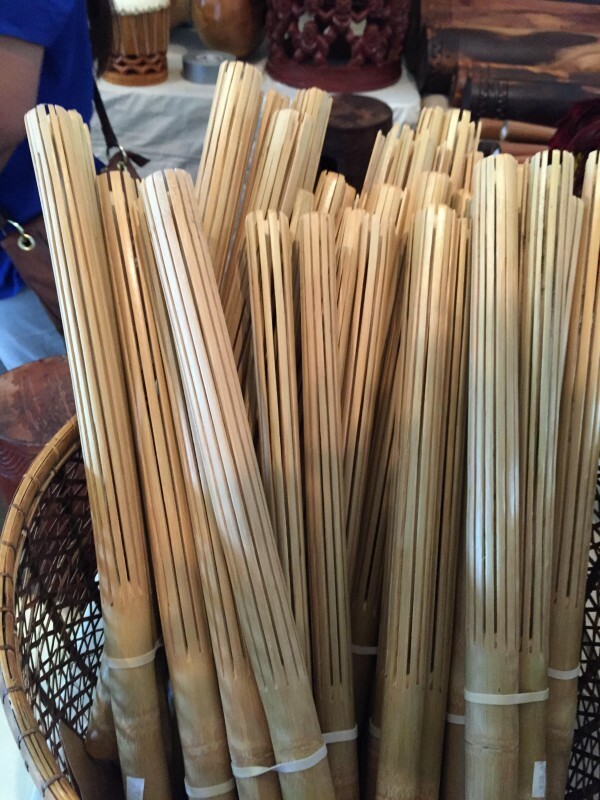 Another instrument is pu’ili, wooden rhythm sticks used in pairs by dancers. Measuring close to 20 inches in length, pu’ili are made from bamboo. Slits are cut in the bamboo lengthwise with strands removed so that the bamboo rattles when moved. 7. Another wooden instrument is the papa hehi, a footboard or treadle. The papa hehi is comprised of a board and a crosspiece. Used to keep time, the papa hehi is used with the kala‘au. As can be imagined, it requires a great deal of concentration and coordination in order dance, chant, and play an instrument during a hula. Some are more complicated than others; for instance it takes a great deal of skill to play the papa hehi with one’s left or right foot while your hands are simultaneously using the kala‘au sticks, sometimes in a different rhythm pattern. 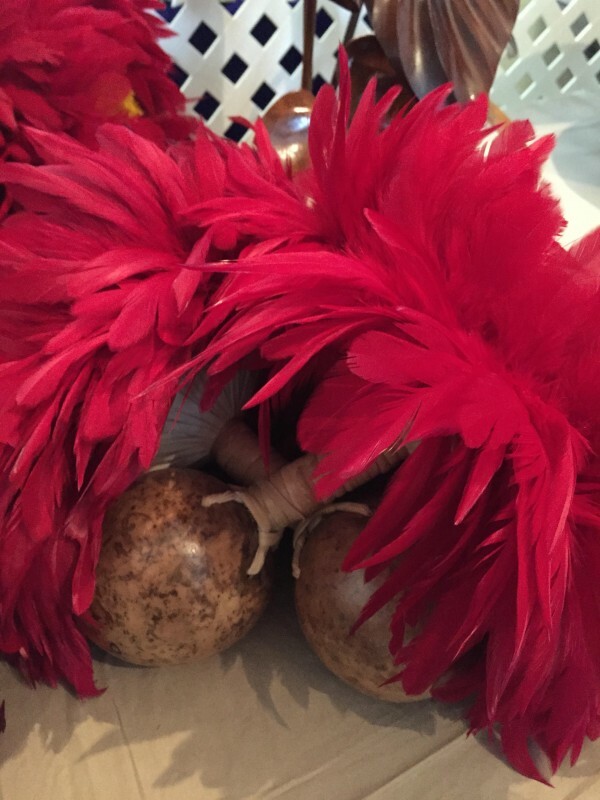 While hula dancers take great care of their instruments, usually keeping them in protective cloth cases, the instruments are made of natural materials and are subject to wear and tear. However, broken hula instruments are not discarded in the trash or treated carelessly. Being made of nature, they are returned to the natural environment. If an instrument is broken, the hula dancer returns it to the garden or burns it.